PSL ImperialExtraSP Italic Series 2, Version 3.1, for Win 95/98/ME/2000/NT, release November 2002. 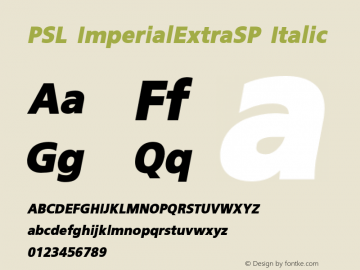 PSL ImperialExtraSP Italic Series 2, Version 3.0, for Win 95/98/ME/2000/NT, release December 2000. PSL ImperialExtraSP Bold Italic Series 2, Version 3.1, for Win 95/98/ME/2000/NT, release November 2002. PSL ImperialExtraSP Bold Italic Series 2, Version 3.0, for Win 95/98/ME/2000/NT, release December 2000. PSL ImperialExtraSP Regular Series 2, Version 3.1, for Win 95/98/ME/2000/NT, release November 2002. PSL ImperialExtraSP Bold Series 2, Version 3.1, for Win 95/98/ME/2000/NT, release November 2002. PSL ImperialExtraSP Regular Series 2, Version 3.0, for Win 95/98/ME/2000/NT, release December 2000. PSL ImperialExtraSP Bold Series 2, Version 3.0, for Win 95/98/ME/2000/NT, release December 2000. PSL ImperialExtraSP font family series mainly provide Regular,Italic,Bold Italic,Bold and other font styles.